Camps to span over seven major Canadian cities this spring. 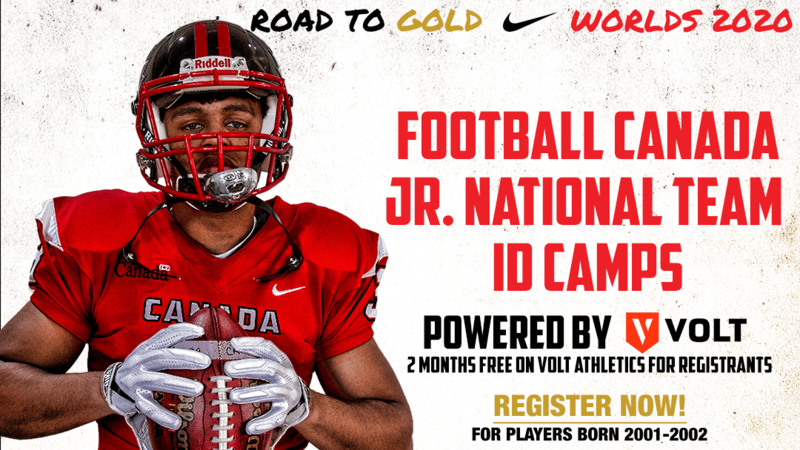 On the heels of announcing the selection process for the 2020 Junior National Team, Football Canada has unveiled the dates and locations for the identification camps that will take place in seven major Canadian cities in the coming weeks. Those who register will also receive two months free on Volt Athletics Strength and Conditioning platform to train before the camps. Overall, these camps will help determine players for the team that will represent the nation at the 2020 IFAF World Junior Championship, hosted by the United States. Canada will be returning to the tournament as the two-time defending champions having won the gold in Harbin, China (2016) and Mexico City, Mexico (2018). Once all seven camps are completed, the field of participants will be pared down to a Top 100 which will be tracked by Football Canada and the Junior National Team coaching staff while getting strength and conditioning, fundraising, and educational support. The identification camps, sponsored by Volt Athletics, are open to those athletes born in 2001 as well as 2002. Participants must be a Canadian citizens and must be a current or former member of their respective provincial football association that are in good standing with Football Canada. Players interested in attending these identification camps will be required to complete a registration form which can be found HERE. Junior National Team hopefuls must bring their own shoulder pads, jersey, helmet, mouth guard and appropriate footwear. It all kicks off on April 13th in Saskatoon, Saskatchewan and will conclude June 22nd in Langley, British Columbia.